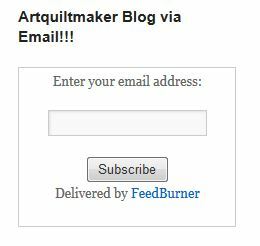 Remember: if you want to receive notices that I have published a new post, sign up for email notifications. Scroll down a little way on the sidebar, put in your email and follow the directions. You will get a confirmation and can cancel at any time. Have you ever heard of The Quilting Company? No? Me neither. Well, it is a new organization made up of Fons & Porter, Quilting Quickly, Easy Quilts, Quilty (I thought that mag was dead! Glad to see it is still around), McCall’s Quilting, McCall’s Quick Quilts, Quiltmaker, Quilting Arts (WHAT???) and Modern Patchwork. I checked out their site. No sign of even the archives of Quilter’s Newsletter. 🙁 Their site is about sales. They have kits and patterns and fabric right up front with no warm and fuzzy letter from the editor. When I went to the Discover & Learn link, I found that they have online classes. There are a variety of different certifications, such as Sulky Teacher Certification ($199), APQS Longarm Certification ($499) as well as regular classes. 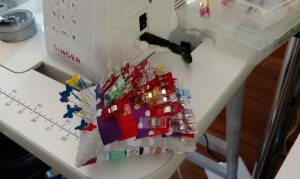 Some of the regular classes are needle-turn applique’ with Jan Patek ($49.99), a variety of Log Cabin quilt classes ($24.99), Anatomy of a Bag ($40), Essential Math for Quilters ($25), and a whole lot of other classes for a variety of prices. It seems they have free classes, but I didn’t see any to click on. There are galleries of quilts from each publication of quilts and projects. The quilts open in a new window where there aren’t any other photos of the quilts from the main page (only a lifestyle shot for the ones I looked at), then all the links to buy the various products needed to make the quilt. I would have at least put up additional photos. There is a section of free quilt patterns and a newsletter you can join. I truly don’t believe that everything in the quilt world should be free. I believe that people should be paid for their designs, patterns and work. This site is all about sales. There is nothing cheerful or friendly to make me want to look around and, perhaps, get interested in a pattern or project. I know the site is new and is probably being built out, but they need to pay some writers to add content, get some photographers to add photos to the project pages and, generally, beef up their offerings. Beyond that I am not sure what to think except one of some magazine (blog, website, IG feed) needs to write a column called Quilt World News so I don’t find out about this stuff in an ad. Perhaps one does and I am missing it? Another organization I came across was the National Quilter’s Circle. Where have I been? They claim it is free, but you can’t see anything without entering your email. Once you enter your email “you have been invited to become a premium member.” Hhmm. Cost is $5 (cheap) and they also have online classes, but still. I can’t see anything, so how do I know if the information will help me? Once you put in your email, you can see a sample video (I haven’t watched any yet). They say they have videos, projects with new videos every week. I’m not joining even at $5, but it could be interesting and cheaper than $25 or $49 of The Quilting Company. After a week or so of receiving the National Quilter’s Circle emails, I might sign off. I get at least one email every day and 1-2 times per week they are offering me a deal to join. I updated some of the pincushion posts to make the pattern information clearer. One pincushion I like to make looks like a little cake. 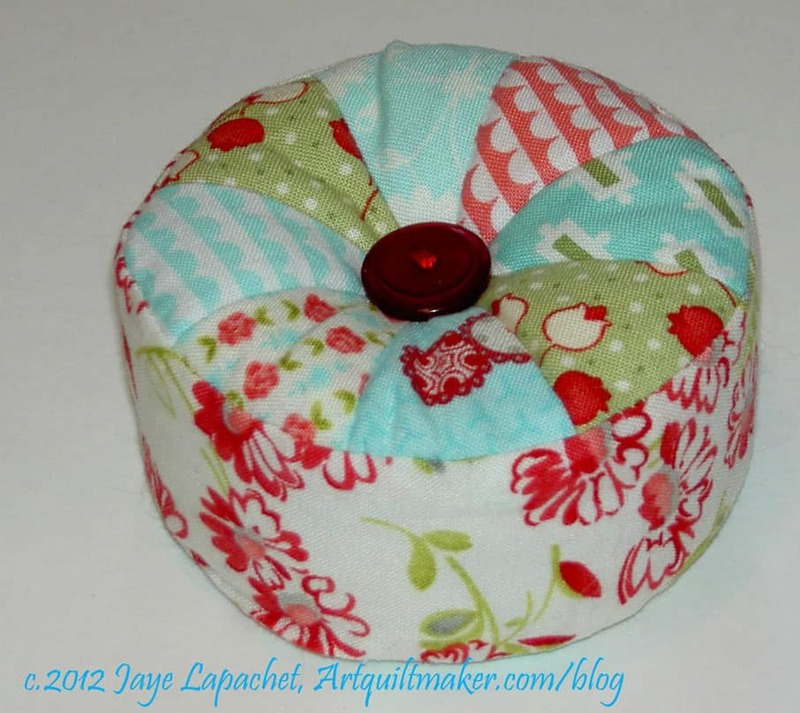 I love this pincushion and may have to make some more of them! It is a pattern from Fig Tree & Co called Petite Gateau. I bought the print pattern at PIQF, but she has a downloadable version, if you want it NOW. The other pincushion I make is the WonderClip pincushion. I found the pattern in Love Patchwork and Quilting, issue 39. It is available digitally in the Apple and Google Play stores. I don’t know if the print issue is still available. Tucker University is a program from Deb Tucker of Studio 180 designs, the Rapid Fire LeMoyne Star ruler, Wing Clipper ruler and many other products. This program allows shops to get a kit for demos and classes. You, as a LQS customer, can look at the available classes (you know you want to make a Hunter’s Star quilt with the Rapid Fire Hunter’s Star ruler!) request these classes from your LQS. Shops can subscribe to the classes and get a bonus if they subscribe for a year. The program looks interesting. Normally, when I make a pillow cover, I just make the back out of two smaller pieces of fabric and make sure they overlap. At some point I got a catalog from Spoonflower and saw that they had a tutorial for putting in a back zipper closure. In an upcoming swap for my guild we are making pillows. I decided that I would try this method. I’ll let you know how it goes. I visited the Quilts Illustrated site to see if they had zippers (they do). I bought a zipper from Elkhorn Quilt Company at QuiltCon to complete the Quilts Illustrated Tool Tote pattern I bought, but now that I have decided on fabric colors for the bag, the zipper is not the right color. As I was looking through the site, I was reminded of the cutting pages. The pattern I bought comes with little tags you can attach to your cut pieces to keep them in order. QI has PDF versions if you need more. Need to make some aprons and want to make them from free patterns? AllPeopleQuilt has a post with 5 free patterns. I updated my Half Rectangle Triangles tutorial page with a technique by Latifah Safir. I saw an episode of Fresh Quilting where she talked about a quilt she made with the HRT shape. She has a nice handout, though she doesn’t talk about different sizes of rectangles or the ending size of the patch made with this tutorial. I also added Jacquelynne Steves tutorial, which does have some math included to help with determining finished sizes. I haven’t found a complete chart yet that allows the maker to look up finished sizes and find cut sizes. As you know from my mentions of the Organizer Club I joined, the Crafty Gemini is my new best friend. 😉 She put out a new video on taking body measurements and how those measurements relate to sizes on patterns. I updated the Quilt Class: Curves tutorial with a new resource. I watched Fresh Quilting and came across the Curves Survival Guide by Jen Carlton Bailly. I’d like to try this, but I might just stick to pins. Since I pre-wash (the living daylights out of) all my fabrics, I don’t wash them after I finish them. I am not sure I want glue in my seam allowances. Still, it is an interesting technique. The MQG has articles, patterns & Videos available to MQG members. Check it all out on the Resources page! If you want to know how thread is weighted, Aurifil posted recently on their Auribuzz blog about that very topic. It isn’t a very long post, but very interesting and has a challenge for librarians at the end! Their blog is very graphically oriented and that makes it a little difficult to navigate. I was introduced to SewTites at QuiltCon. I got a couple of samples and find them to be strong. These are magnets described as “A way to “pin” when you can’t! Magnetic “pins” for sewing super thick materials, like leather or cork, or pieces that aren’t near an edge, like pockets on bags. Simply align the pieces you need to sew together, snap on the SewTites, and SewTite-ly!” I really like this idea for keeping layers together before sewing. I’d love to see these work for basting, but can’t see how to keep the quilt taut while sliding the magnets under the quilt. If you make bags, you might want to try them out. Schmetz has a color coded chart for their needles on the web.